Damask Wallpaper Patterns New Category! Damask, once restricted to formal rooms, has today come into much more general use than ever before in its long history. In this adaptation to our 20th century life, two extremes of patterns have evolved. One is characterized by new colour effects, the other simulates a fabric dulled and worn by age. And under good decorators or discriminating householders, damask-covered furni- ture and window and other draperies are successfully associated with fine furnishings of many periods, including our own. The damask weave is a fabric on which the pattern is brought out by the lines of its weave running in a different direction from that of the ground. Damask linen tablecloths illustrate this beautifully. In modern damask, there are incor- porated with the traditional silk other materials, such as cotton, linen, wool and artificial silk, in order to produce new effects. The fabric is, however, made in essentially the same manner as in the 12th century, when it got its present name from the city of Damascus, then famous for the beauty of its silks of this character. 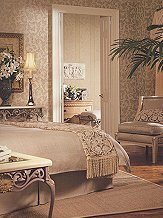 Most of the designs used in damasks today are copies of those woven centuries ago in Italy, Spain and France. This varied background allows the damask-covered chair, couch or window draperies to fit into the prevalent vogue for Spanish, Italian, French or Georgian interiors. Though damask weaving was not an English art, the English decorators of the 18th century used large quantities of Italian damasks, both for furniture coverings and as hangings for walls. In France, the period of Louis XVI – a period of dignified luxury – developed many beautiful symmetrical designs, often with stripe effects combined with flowers and leaves. Most of the Italian weaves now reproduced hark back to Renaissance motifs, wherein the pomegranate, the apple of love of medieval times, surrounded by flowers and leaves, often forms part of the pattern. Tones of colour are found in some of these old Italian fabrics – violet and crimson, or an old gold that has the Cinquecento charm. While the best designs of damasks are derived from precious bits preserved in museums, there are also patterns inspired by the life of today. Some designs sug- gestive of Japan are in brilliant reds, like those employed in lacquer; the straight trunks of the bamboo are shown against misty mountains and violet clouds. Especially modernistic is a pattern of new flower forms that may have been inspired by roses, but it is removed from reality by diagonal rays of darker tones that slant across the pattern. Delicate peach, jade or other hues, never used by the old Italian and French damask weavers, make these modern weaves distinctive.